MakaPads provide effective, low-cost protection to every girl and woman. 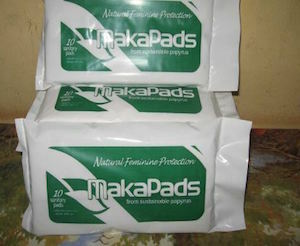 MakaPads are made from papyrus and paper waste. The fibers are beaten, dried and softened using no electricity. They are assembled with a moisture barrier and mesh covering. MakaPads can be purchased with or without an adhesive that slips into knickers with special elastics to hold the pad in place. ADVANTAGES- Sells for 50% less than other brands.- Higher absorption capacity than other pads.- One pad can be used for 8 to 10 hours.- Made from local papyrus.- Production uses very little electricity.- Certified by the Uganda National Bureau of Standards. The Makapads project in Uganda conducted research which revealed many girls were not attending school on the days they were menstruating due to lack of affordable protection materials. This meant that girls feared stigmatization due to soiling themselves while in school. Further research during field trials revealed that about 90% of the urban poor women and girls did not use (off-the-shelf) sanitary pads because they were expensive but improvised with unhealthy materials such as banana fibers, grass, leaves, old newspapers, and pieces of cloth. In response to this, the project at Makerere University's Faculty of Technology now manufactures sanitary pads which are 75% cheaper and thus more affordable to the rural primary school girls who have started their menstruation. The sanitary pads (trademarked Makapads) are the first to be made from 99% local materials with the main raw material being papyrus reeds, cut from the vast, abundant swamps and riverbanks all over the country.